While Valve’s Source engine is no Unreal 3, it is capable of impressive graphics all on its own (as anyone whose played the Orange Box can tell you). Its software development kit is also a favorite of modders and game developers alive, as many projects, mods and independent game releases alike have made use of it. Outerlight’s The Ship is one of these projects. Originally designed as a mod of Half Life 2 (which is why its menus are similar), the developers made this game an independent release. This is probably for the best, because The Ship has many unique gameplay mechanics that help set itself apart from other first person shooter games. 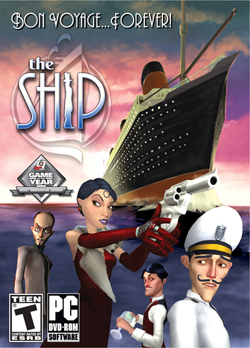 The Ship can best be described as a mashup of Manhunt and the Sims, given a PG-13 rating and taking place in the 1930s. You are a part of a cruise which has been hijacked by a madman known as Mr.X. Your character (who can be customized by various articles of clothing that you find) is now an unwilling participant of his twisted game; you have been given a target to assassinate, and you have to take them out. If you win, then you’ll get paid for it, and you’ll be paid even more if you take out your mark in the manner Mr. X wants you to. After your target is dead, you’ll be given another mark. If you’re a good killer, then you might even win your freedom. However, if you lose, or choose not to participate, then… well, you get the idea. By the way, I should remind you that everyone else on the ship is a hostage too, therefore they are all also unwitting participants in Mr. X’s game. This means that your mark also has a target they are hunting. More importantly, this means that while you’re on the hunt, there is someone else who is hunting YOU. Just as you can find where your mark is at at any time from their last known whereabouts, your hunter can deduce where you are at, so if you think you are safe by simply barricading yourself in one location until the coast is clear, then you have another thing coming. Therefore, you have to constantly be on the move, least you get caught slipping (by the way, yes, you can kill your potential assassin should you encounter him or her, but your safety will only be temporary, as eventually another hunter will be put on your tail). Now your cabin is locked, so you could just stay in there right? Maybe, but there is a catch. Similar to the Sims, your character has needs that need to be addressed. He needs to eat, drink, use the bathroom (both #1 and #2), sleep, wash and clean himself, and even keep his spirits up by reading and chatting with people. When you stop to address one need, another need will increase. For instance, if you eat, your hunger goes down, but you’ll have less time to wait before you have to answer the call of nature. While this system is a bit tedious and complex at times, it does a good job of forcing you to be on the move. You’ll frequently have to visit the bathroom, vending machines, and other places on the ship. When you stop to address your needs, you’re a potential target for your hitter. Oh and there’s another catch; even though a criminal has control of this ship, there is a jail system for if you are somehow spotted murking your opponent, weather it’s on a security cam, by a witness, or by security. You’ll have to spend time in jail and/or pay a fine. While this is a bit much superfluous, it also serves to make players think about how they’re going to approach thei kill. As you’d imagine, stealth is key here. Along with a campaign mode, there also multiplayer, and Single player modes which use bots. The Ship’s jail and needs systems carry over to the multiplayer Hunt mode as well, making this a different gameplay experience. Hunt matches will move at a different pace than what FPS gamers are used to, so anyone approaching this as the typical FPS fragfest won’t last long. On the plus side, the mechanics in the hunt mode serve to eliminate the typical jerk players who blow away everyone and spawn camp. Of course the typical deathmatch mode is available too. The Ship obviously isn’t gonna make anyone throw out their copies of Halo, Call of Duty 4, or Unreal Tournament III, but it manages to provide a unique experience of its own, and brings with it a sense of humor and some excellent graphics (thanks in no small part to Valve’s source engine). Best of all, it’s cheap. It ships in three components (the single player, tutorial, and multiplayer game) which can be downloaded via Steam for only $20. I can’t help thinking that it would have made an excellent addition to the Orange Box, but oh well. It’s not perfect, but it’s an excellent debut for Outerlight. Hopefully we’ll see even more good releases from them. They are already at work on a sequel, so that will be something to watch out for in the near future. With a few improvements here and there, The Ship could be the start of the next great FPS franchise. That actually sounds fairly interesting, and its a game I’ve seen on the shelf, but never really thought to look into. I might have to check it out.